\Holy Easy Shifting Batman!! That's what I said last night after completing this mod. My 2002 Stone has undergone radical transformation lately. One of the better mods was by cutting and welding and grinding on the lower frame rails to move all my foot controls six inches rearward. Since then I have been looking for the ultimate in shifting action. First I’ll describe the stock system. The foot shift lever is connected via a threaded link rod and ball joints to a bellcrank mounted with a pivot bolt on the frame rail. This bellcrank is connected with another threaded rod and ball joints to the actual shift arm on the back of the transmission. Take the time to study the system and see how everything moves around. When you are sitting down staring at all this crap, move the foot lever with your hand. VERY little force is required on the foot lever but you will notice the end of the lever (where your toe would hit it) moves a country mile during shifting. I postulate that one of the reasons a Guzzi trans shifts so badly because of the distance you need to move everything. So, at this point, you would say to yourself "Self, how do I make shifting action better/faster?" Well, there are 3 ways to accomplish this. Method one is by moving your foot a LOT faster. Method two is by preloading the shifter for shifts. Method three is by messing with all that crap linkage. Starting in 2002, and probably sometime before that, Guzzi started drilling TWO holes in the portion of the bellcrank for where the threaded balljointed rod connected it to the arm on the transmission. Guzzi ships the bike from the factory with everything set up using the hole that is nearest to the pivot of the bellcrank. 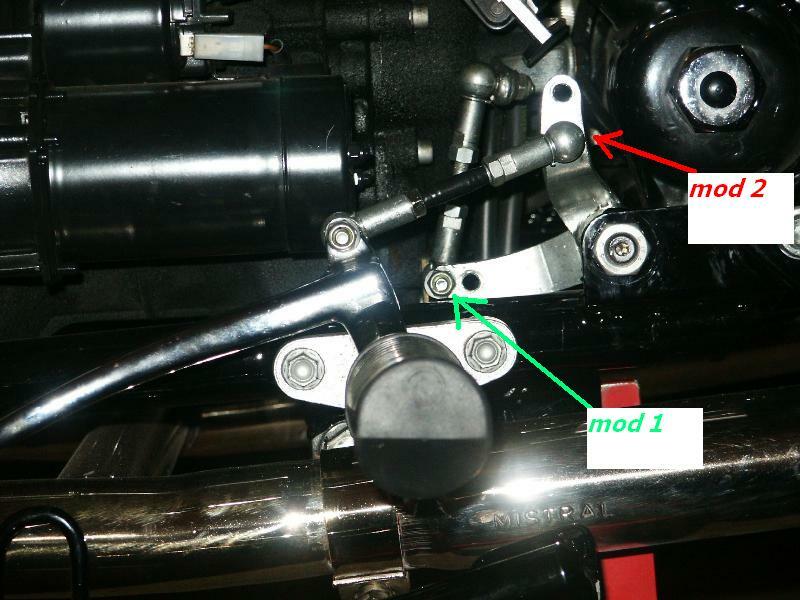 A very popular mod (I call it Mod 1) is to move the threaded linkage rod thing to the outermost hole on the bellcrank. This will reduce the foot lever throw by about 8mm or so and increase force required on the foot lever by about 17%. The increase in foot force required is barely noticeable since your foot has to travel a smaller distance. Well, I looked at this and figured there was room for more improvement. Enter Mod 2. As I was staring at the bellcrank, the light went on. Why not drill another hole below the mounting hole for the rod that connects the foot lever to the bellcrank. Off came the bellcrank and out came the 6.25mm drill bit. I drilled a new hole 15mm below the current hole on the bellcrank and slapped it all together. This mod decreased throw at the end of the foot lever by a whopping additional 12mm. So now, overall throw was reduced by 20mm over the stock as delivered setup. Stock throw on downshifts is slightly more than up-shifts and is about 48mm. With Mod 1 and Mod 2, it is down to about 28mm. That is a 41% or so decrease in lever travel. Now, enter Mr. Physics and the principles of 'Mechanical Advantage'. Since we reduced foot lever throw, foot force required on the lever will increase a proportionate amount. So, you now need 41% more foot force on the lever. If you move the lever with your hand, it is very noticeable. With your foot it is noticeable, but the reduced lever effort really cancels that out. Shift effort force stock is stupidly low anyway, maybe 5 pounds? So with Mod 1 and 2, you would need 7 pounds of push on the lever. Whoopee. Unless you’re some girly man and need Hanz and Franz to visit you to pump you up, the increased foot force will be a non-issue. Consider that most of the force your toe exerts is in the first initial movement anyway, a very quick jab moves the shift lever perfectly now. Once you go for a ride with Mod 1 and 2 made, the difference will be incredible. You will find that you do not have to preload the shifter as with the stock setup for clean powerful shifts. A quick jab makes it go up and down gears with an almost Japanese bike feel now. Yes, you need a little more force on the lever over stock, but it really is not very noticeable. I had a 1996 Harley Sportster and the foot force required on that lever is about the same as with Mod 1 and 2 made, but overall travel of the foot lever is much less which makes for great shifting action. Preloading the shifter makes it feel damn near race like now that the foot lever throw has been reduced so much. There is a very positive engagement now. You can drill the extra hole with everything mounted on the bike, but you should really take the crank off. I drilled the new one 15mm lower which barely leaves enough room on the backside so the nut on the ball joint does not interfere with the bend radius on the bellcrank tab.